Take just a moment to read below and you will quickly discover the myth of "free shipping," how you can save big in the future by avoiding this gimmick, and why ToGoGarden will never use this or any other gimmick on our website. The definition of the word "gimmick" is: A device employed to cheat, deceive, or trick...and our team at ToGoGarden is comprised of folks who simply cannot do this to our customers. Back in the 1990's, Amazon.com started the whole "free shipping" gimmick. That was when they were shipping mostly small books, and shipping rates were much lower than they are today. So, what Amazon would do is take the shipping cost and simply add it to the retail price of the book. If the shipping charges on a particular book were a measly $2, and what Amazon needed to sell the book for was $17.99, they'd just mark the book $19.99 in their store. They got the price they needed for the book and you THOUGHT Amazon was such a special company because they were providing you with "free shipping." But, even today, Amazon charges you a fee to get "free shipping," and the free shipping comes on only select products. It's a fact that FedEx, UPS, USPS and other mail carriers have not and will never ship anything for free, not for any person or any company, not even Amazon. The same is true for any and every online retail store - none of them truly ship you any product for free. Retailers simply take the cost the mail carrier charges to ship a particular product and add it to the retail price. 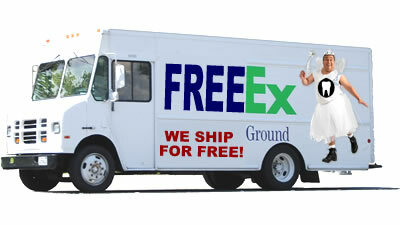 Here's a couple simple examples of how the "free shipping" gimmick works to your financial disadvantage. Just compare the total price of our competitors to our net "DELIVERED PRICE" and you will see that you are getting a much better price from ToGoGarden! Like any other business on the planet, ToGoGarden is in business to make a profit. But we vow to never use gimmicks or tricks on our customers. What you see on ToGoGarden is what you get. We price things as we need to to make a profit and then allow FedEx shipping calculators to add the appropriate charges for shipping. This way, you know exactly what you're paying for and, as demonstrated above, you're saving money! At ToGoGarden, we are totally dedicated to providing our customers with the BEST quailty plants and products, the MOST accurate information you'll find anywhere on the internet, at the BEST price.